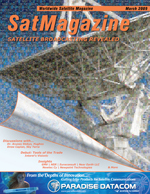 Using satellite to backhaul ABIS links is certainly nothing new. A vast array of technologies and products provides numerous options for operators to choose from when designing networks. But with the rising cost of satellite bandwidth and the need for more of it to support an ever increasing number of voice, data and now video services, operators must seek ways to reduce both their hardware investment costs and operating expenses, especially when fierce competition forces them to provide these new services without raising their rates. Satellite modems have evolved over the years, both in terms of flexibility and complexity, to become one of the most significant elements of a backhaul terminal. This is most certainly the case when technologies and features typically offered in outboard boxes such as TCP/IP Link Accelerators, IP Encapsulators, multiplexers, test instrumentation, performance monitoring and so forth are incorporated into the modem where they can exist symbiotically as a feature of the modem, able to be controlled and monitored by the modems front panel. The result is a reduction in required rack space, fewer spares, reduced system complexity, reduction of box count and associated interconnecting cable and most importantly  reduced cost. In todays cellular networks, it is common to have multiple traffic channels of varying formats at a BTS site that need backhauling to a BSC. Paradise Datacoms engineers developed MultiMux, a unique and highly advanced feature that can accomplish this feat by multiplexing as many as four channels of G.703, Serial data and/or IP traffic formats into a single carrier by a single modem. In the case of G.703, Drop and Insert can be performed on any or all channels simultaneously with the aggregate carrier size determined by the bit rate of the modem, as opposed to a pre-set rate as is the case for most outboard multiplexers. Not only does MultiMux allow the operator to reduce the number of modems required to support the network, but the transition from non-IP to IP (i.e. CDMA to GSM) is possible without changing or adding modem hardware. In order for a network to operate, a minimum contingent of test instruments is necessary to perform critical monitoring and diagnostics functions required to keep the network healthy. Some of these instruments include a Spectrum Analyzer, Bit Error Rate Tester (BERT), Constellation Monitor Oscilloscope and, in some cases, IP Traffic Analyzer. This list represents tens of thousands of dollars in capital expense for an operator. Paradise Datacom includes these functions in their satellite modems and has continually refined their properties and performance. Though some other modem manufacturers tout similar features, they usually possess limited functionality and generally lack sufficient sophistication to actually replace external test equipment. Paradise Datacoms integrated Spectrum Monitor runs on the modems motherboard and is available in all of their modem families. It features multiple bandwidth settings, the widest of which allows for the monitoring of adjacent carrier traffic on the transponder. This monitor can be used while the modem is carrying traffic and uses a peak-hold function that has been used successfully to identify interfering carriers such as WiMax in cellular networks. Similar to the other diagnostic tools in the modem, it is accessible over the Internet with a PC or laptop from anywhere in the world, or accessible over the satellite link itself. Like the Spectrum Monitor, this Bit Error Rate Tester is a fully functional facility and is actually superior in some ways to a free standing instrument. The set up is easier, in that you can simply copy the configuration of the modem being tested and receive immediate sync. The EZ-BERT offers identical test patterns to a FIREBERD tester, including the ability to setup custom patterns. Features include error injection, plus display of error count, BER, and link latency. This invaluable tool allows a graphical view via web browser of carrier modulation integrity, with a user selectable persistence feature to capture momentary or intermittent events. This monitor allows system debug capability including detection of phase noise, carrier cycle skips and interference. A number of graphs are available via a web browser showing detailed IP performance against time for the IP Traffic port, Satellite Traffic, and M&C port of the modem. Graphs include packet throughput, dropped packets and errored packets, with individual graphs for transmit and receive data in all cases. With backhauling costs representing as much as 30 percent of an operators total cost of operation for a mobile network, link efficiency becomes a key factor in making the business model work. We can begin to increase link efficiency of voice circuits at the baseband level by removing unnecessary information through the use of sophisticated voice compression technology. For Paradise Datacom, this technology resides in an internal ABIS Optimization Interface card and is available in the Evolution and Quantum series modems. Addressable from the modems front panel, the optimizer samples the ABIS data stream and removes the silence packets in the digitized voice traffic. It also removes null packets from the signaling and data traffic. This feature can represent 30 to 50 percent reduction in the bandwidth required to support the link. Depending on specific network elements, such as earth station antenna and amplifier sizes and the actual satellite being used, further link optimization may be available by overlapping carriers on the transponder. Paradise Datacom has licensed ViaSats patented Paired Carrier Multiple Access (PCMA) technology, which can be used either in addition to, or as an alternative to, previously mentioned efficiency schemes. PCMA is available as an external box and will soon be available as internal feature on Evolution and Quantum modems. PCMA can be used to reduce satellite bandwidth requirements by up to 50 percent by overlapping transmit and receive carriers in the same space segment. Adaptive self-interference cancellation is used to subtract the units transmitted signal from the composite received signal, leaving just the desired signal. Using Paired Carrier, uplink and downlink carriers overlaid, can save on space segment. Paired Carrier is designed for use in point-to-point links. For point-to-multipoint operation, the Paradise PCMA-70 Satellite Bandwidth Extender can be used to overlay several smaller carriers on top of a larger carrier and then cancel the larger unwanted carrier using a single PCMA-70, before feeding the output to the individual demodulators responsible for processing each of the smaller carriers Cellular network operators can realize major savings in capital and operations expenses by selecting the correct modem, technology, and features.